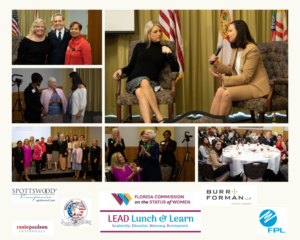 Florida Commission on the Status of Women | The Florida Commission on the Status of Women recognizes and supports women of all ages to achieve their fullest potential. Welcome to the website of the Commission. We are a non-partisan body with a focus on raising awareness and celebrating the contributions and successes of all Floridians, along with providing a collaborate platform for those seeking information on issues that affect women, girls and their families in our state. Our goal is to provide communication, promotion, and collaboration among the hundreds of organizations working in all 67 counties that are focused on the welfare of the women of Florida. We are all interested in improving the well-being of Florida women and girls – and by extension, all Floridians. In doing so, we strive to be a resource for lawmakers, businesses, and residents so they have a better understanding of these important issues. Inaugural LEAD Lunch & Learn in Tampa a Tremendous Success! 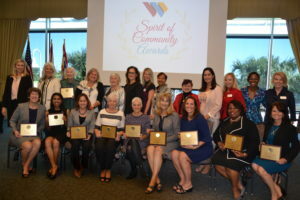 The newly named Spirit of Community Award recognizes meritorious women and men who have improved the lives of women of Florida and have served as positive role models for women and girls in their community. Recipients of the Spirit of Community Award were honored during the Commission’s 4th Quarterly meeting on Friday, November 16, 2018, Noon – 2:00 PM at the Tampa Bay History Center. 2018 Florida Women’s Hall of Fame Inductees! The Florida Commission on the Status of Women today inducted three new members into the Florida Women’s Hall of Fame at a distinguished ceremony in Orlando as a part of the Future of Florida Forum. Celebrating its 36th anniversary, the Hall of Fame honored 2018 inductees Adela Hernandez Gonzmart (Ybor City), Lee Bird Leavengood (Tampa), and Janet Petro (Indian Harbour Beach) for their significant contributions to the citizens of Florida. For the second consecutive year since its establishment, the Hall of Fame ceremony was held as a part of the Florida Chamber Foundation’s annual Future of Florida Forum. The centralized location and expanded celebration presented a greater opportunity to recognize the many ways that women’s history has become woven into the fabric of our state and national story in a more meaningful way. With the support of the Florida Chamber Foundation, the event was streamed live for audiences around the state and attended by some of the leading voices in Florida government and business. The ceremony included an evening of honor with remarks from Florida Attorney General Pam Bondi; Florida CFO Jimmy Patronis; Doug Davidson, Chair of the Florida Chamber Foundation; Crystal Stiles, Director of Economic Development for Florida Power and Light Company, and Commissioners from the Florida Commission on the Status of Women. Joined by their family and friends, inductees were celebrated with commemorative videos and remarks about the legacy of accomplishments and the contributions they made to the lives of people across Florida. The evening was anchored with an induction ceremony led by Florida Attorney General Pam Bondi where inductees were awarded with replicas of the plaques that will be placed on the Hall of Fame wall in the Florida Capitol Rotunda, as well as an American flag that was flown over the United States Capitol in their honor. Hall of Fame members were selected by Governor Rick Scott from a group of ten nominees selected by the Florida Commission on the Status of Women. This year’s inductees will join current members on the walls of the Florida Capitol. Visitors can view all of the Hall of Fame members immortalized on plaques in the Capitol Rotunda or on the Florida Women’s Hall of Fame website. 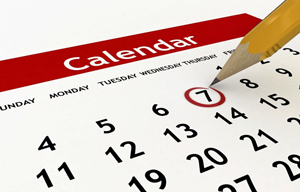 Click here to view and download event photos.